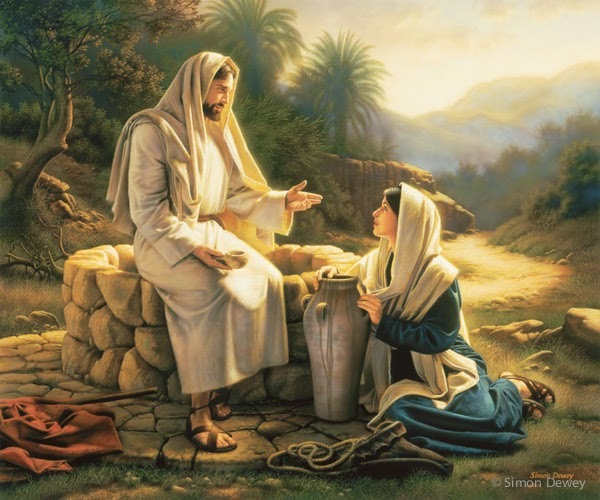 Since the Gospel reading about the Woman at the Well (John 4:5-42) is very common during the season of Lent, I thought I’d add this re-post to the #WorthRevisit blog link-up today. I love this Gospel story; it is one of my favorites. The story of the Woman at the Well reminds me of the sacrament of Confession. Jesus meets the woman where she’s at, and He loves her, even with all her failings and shortcomings. Like the Woman at the Well, Jesus meets us where we’re at, in what we’re struggling with, in the sacrament of Confession. All we have to do is open up to Him, and His mercy, grace, love and peace will overflow like living water onto our parched souls. Once in a homily, our pastor talked about Jesus’ gaze at this woman, and He reminded us that when we look upon the Lord in prayer, He really is looking back at us. Sometimes, I forget that, when my prayer is dry or when I feel like He is being silent and not responding quickly enough to my pleas. Well, perhaps He is being quiet, but that doesn’t mean He’s not present, not gazing lovingly into my eyes. I have to remember to be still and be with Him a bit more when I pray. I wrote about this Scripture passage five years ago, but I am reposting it again today. I hope the message of God’s love will bless you in some way today. God bless you, dear friends, as we near the holiest of weeks! This image was a focal point on my retreat—Be Filled—a few weekends ago. A small card was taped onto the retreat journals that were handed out. Large posters with this image on it surrounded our meeting room. And every time I gazed upon it, I saw myself. I was the woman at the well. I was the woman in need of a drink. I was the one who Jesus was looking so intently at with those eyes of love. Can’t you just picture yourself as the woman in this picture? Yes, we all know it really is the Samaritan Woman at the Well. But couldn’t it really be any one of us? Here is this woman, encountering Jesus. At first, she does not understand Him. Maybe she does not feel worthy of talking with Him, for she is a woman after all, and a Samaritan woman at that. But with such love, He sits and talks to her. Doesn’t this picture capture the idea that in this whole world, she is the only one who matters to Him at that very moment? He offers her water, life-giving water, that she may thirst no more but be filled completely. And even though she reveals her past to Him, He doesn’t turn away. Rather, with mercy and love, He draws her closer unto Himself. It is clear she has faith in the One who is to come, and when He tells her He is the Messiah, she cannot help but tell everyone around her about Him. Sometimes I feel like I can’t possibly be loved by Jesus. My sin is too big. My fear is in the way. My past mistakes are haunting me. I am bound by a spirit of regret, anger, despair, doubt. Jesus does love me—and each one of you, too. Our faith tells us this, Scripture reveals this to us, the Church teaches this, and so it is true. Jesus loves me. Jesus loves you. He wants us to come to Him like that woman did. He wants us to sit at His feet. He wants that time when it is just us and Him. He wants us to believe that we are that important to Him, because we are. He wants to fill us with life-giving water—the Holy Spirit—to banish once-and-for-all our sin, our fear, our doubt, and be redeemed by His overflowing mercy and love. Like on my retreat, I hope to meet Jesus this Lent at the well. To drink deeply of His mercy, healing, forgiveness, love, grace and peace. To come back again and again for more. He wants to pour out lavishly upon me, upon all of us, if only we ask and are open to receiving Him. I hope to do this to receive. But also I hope to do this to sacrifice with Him, as He journeys to Calvary. May I love with Him by taking up my own cross along side His. That in the suffering and loss I may also experience Resurrection in the most fulfilling way possible. Deeply. Purely. Completely. Lovingly. And then after I do this, like the Samaritan woman, may I share this faith, this truth, this love with others—my family, my friends, anyone God places in my life—so that they may drink deeply, too. This Lent, and for years to come, let us be like the Woman at the Well, so we may thirst no more. Your writing is great. Just the reminder everyone needs with Easter quickly approaching. I love the idea of Jesus looking back at us. I will remember that next time I am in prayer. Thank you.